If you have a squeaky dryer, the noise could be coming from the drive belt, the drive motor or from one of multiple other parts. If you have an accurate mental image of the anatomy of your dryer, you might be able to intuit the cause of the noise so you can be prepared to make the repair when you remove the cover. You can get that image by studying the manual, which is available on the manufacturer's website if you don't have a copy at home. Appliance repair isn't for everybody, and if it's not for you, don't hesitate to get help. 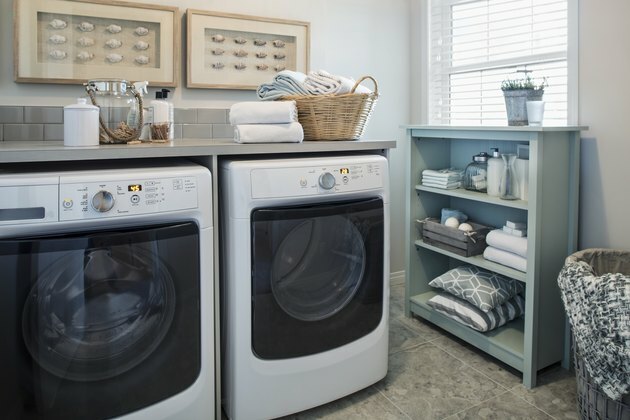 Whether you have a Kenmore, LG, Maytag or Whirlpool dryer with a squealing noise, the chances are that you're going to need to replace worn-out parts, and an appliance repair technician has access to everything you need. Moreover, a licensed technician has the tools and the know-how to work safely under the cover and can guarantee the work. Any one of these parts can wear out and cause squeaking. The drive belt is the most common culprit because it starts slipping when it stretches with age. If the drive belt is loose, the drum probably doesn't turn smoothly when it is full of clothes. To replace any of these worn parts, you have to unplug the dryer and remove the cover. You'll probably be able to identify the worn part by looking carefully with a flashlight. You can replace the drive belt, glides and rollers yourself, but if the bearings have worn out, you'll probably have to pull out the drum to replace them, and that's a job for a pro. The blower wheel is a fan that circulates air through the dryer and out the exhaust port. Because it turns quickly, squeaks from this part sound more like high-pitched squeals, and if the wheel is damaged, you won't feel much air blowing from the exhaust port. The blower housing is in the base of the machine, and you have to remove the cover to access it. Check the ports for lint or other debris that could be interfering with the fan. If you don't find any, disassemble the housing and ensure the wheel is securely attached to the motor shaft. Replace the wheel if necessary. Although it isn't common, something inside the drive motor can break or come loose, and the result is a high-pitched squealing sound whenever the motor is running. This is a sign of impeding motor failure, so it calls for immediate action, which is usually to replace the motor. You can find a replacement through an online appliance parts outlet or by visiting the manufacturer's website, but installing it is another job for which you need a pro. The most important maintenance procedure to perform on your dryer is to regularly clean the lint trap and the vent. This prevents the dryer from overheating, which increases the wear on moving parts, especially the belt. You can sometimes handle Maytag, Whirlpool or Kenmore dryer motor squealing by ordering a repair kit from the manufacturer. It contains replacements for the parts that most frequently wear out, and you can usually replace these parts yourself. Look for the maintenance kit on the manufacturer's website.